Map: lake boundaries c. 1960, countries at least partially in the watershed are in yellow. The Aral Sea (Kazakh: Арал Теңізі, Aral Tengizi, Uzbek: Orol dengizi, Russian: Аральскοе мοре) a landlocked endorheic sea in Central Asia, straddles the boundary between Uzbekistan to the south and west and Kazakhstan to the north and east. The name roughly translates as "Sea of Islands," referring to more than 1,000 islands of 2.5 acres (one hectare) or more that dotted its waters. Once the fourth-largest lake on Earth, the Aral Sea shrank to less than 50 percent its original size in a matter of decades. This reduction came as a result of the diversion of its in-flowing rivers, the Syr Darya and the Amu Darya, by the Soviet Union for irrigation purposes. This loss of water turned the once freshwater lake into one as salty as the ocean. By the end of the twentieth century, the once great sea had been broken into two separate lakes. Its entire ecosystem suffered a near collapse due not only to diversion practices, but also to extreme pollution resulting from biological weapons testing during the Cold War, industrial projects, and fertilizer runoff. The health and livelihoods of thousands of people living in its ecosystem were severely comprised. Since the collapse of the Soviet Union, nations and organization began coming to the aid of the Kazakh and Uzbeki governments in an attempt to reverse the wrongs that had been done to the Sea and its rivers. As a result, the North Aral is reviving. However, the Uzbeki government is focusing on oil exploration in the South Aral's dry seabed, rather than reviving it. The near-collapse of the Aral ecosystem serves to illustrate a crucial point - that rivers and the seas into which they flow influence the environment, and the lives of people, over incredible distances. Decisions that affect these waters must take into consideration every possible result. The Aral Sea is a saltwater lake straddling the boundary between Uzbekistan to the south and west and Kazakhstan to the north and east. This lake east of the Caspian Sea was once the world's fourth largest body of inland water. The Aral Sea, in 2003, had shrunk to well under half of the area it had covered 50 years before. In the heart of Central Asia, the Aral Sea is characterized by a desert-continental climate. Experiencing little rainfall (annual average of 4 inches, or 100 mm), the cold winters and hot summers make for a generally inhospitable environment. The second half of the twentieth century brought an incredible degree of shrinkage to the Sea due to diversion of its river sources for agricultural irrigation. Nearly half of the lake's volume had been lost by 1980. 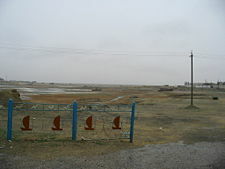 The Syr Darya and Amu Darya Rivers, the Aral's main sources of water, became empty riverbeds during the summer months. The drastic depletion caused salt and mineral content to rise dramatically, making it unfit for drinking. Fish began to die off causing the fishing industry to be all but destroyed. The shrinkage also drew the lake's shores in miles from its once lively ports. The ecological catastrophe that has become the Aral Sea stemmed from years of mismanagement and neglect. Without thought for the future, excessive diversion occurred of the Amu Darya and Syr Darya rivers for irrigation, shrinking it dramatically. One of the greatest abuses suffered by the Aral was decades of use as a dumping ground for raw sewage runoff, resulting in the extermination of many native fish, causing economic problems as well. Vast amounts of water were abstracted for power generation. The Russian government decided in 1918 that the two rivers that fed the Aral Sea, the Amu Darya in the south and the Syr Darya in the northeast, would be best utilized by diverting them in an attempt to irrigate the Central Asian desert. The Soviet plan was for cotton to become its new "white gold" - a major export. The area was also to be used to provide food such as rice, melons and grain. Eventually, Uzbekistan did become one of the world's largest exporters of cotton. Construction of canals began on a large scale in the 1930s. Many of them were poorly built allowing water leakage and evaporation. The Qaraqum Canal, the largest in Central Asia, experienced an estimated 30–70 percent of water waste. Today only 12 percent of Uzbekistan's irrigation canal length is waterproofed. By 1960, somewhere between 20 and 50 cubic kilometers of water were diverted each year to the land instead of flowing to the sea. Thus, most of the sea's water supply had been diverted, and in the 1960s the Aral Sea began to shrink. From 1961 to 1970, the Aral's sea level fell at an average of 20 cm a year; in the 1970s, the average rate nearly tripled to 50–60 cm per year, and by the 1980s it continued to drop, now with a mean of 80–90 cm each year. However, the rate of water usage for irrigation continued to increase: the amount of water taken from the rivers doubled between 1960 and 1980; cotton production nearly doubled in the same period. By the late 1980s it had receded to the extent that two separate sections were formed, the “Greater Sea” in the south and the “Lesser Sea” in the north, each of which had a salinity almost triple that of the sea in the 1950s. The total area of these two sections combined were reduced to approximately 13,000 square miles (33,800 square km), and the mean surface level had dropped by about 50 feet (15 meters) by 1992. The increased salinity meant a loss of freshwater sea-life, negatively impacting the fishing industry. In 2003, the South Aral further divided into eastern and western basins. 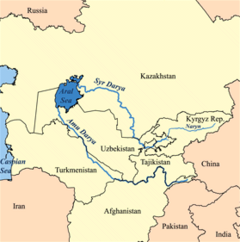 After the demise of the Soviet Union, the governments of the surrounding states, Kazakhstan, Kyrgyzstan, Tajikistan, Turkmenistan, and Uzbekistan, intervened and drew up policies intended to encourage less water-intensive agricultural practices, thereby allowing more river-flow into the lake and stabilizing its level. Implementation of the policies had a positive impact, but not to the level necessary to have a significant impact. In 1994 these nations formed a joint coordinating committee for further advancement of the Sea project, however these generally inter-competitive states have had difficulty coming to agreement and progress has been stalled. 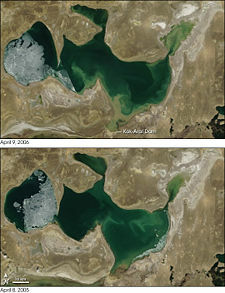 Comparison of the North Aral Sea before (below) and after (above) the construction of Dike Kokaral. 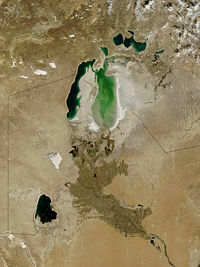 A channel was dug to connect the two separate bodies of water formed from the Aral Sea in the 1980s (the southern “Greater Sea” and the northern “Lesser Sea”), but that connection was gone by 1999 as the two seas continued to shrink. In 2003, the South Aral further divided into eastern and western basins; the evaporation of the North Aral has since been partially reversed. The base was abandoned in 1992 following the disintegration of the Soviet Union. It soon after became the international center of environmental concern. With the shrinking of the sea, many of its islands have become peninsulas. By this time, Vozrozhdenya was only 6 miles (10 km) from the mainland. In 1999 still-living anthrax spores were discovered on the site, and scientists feared that when the island was no longer surrounded by water, animals could carry anthrax to populated areas. ↑ 1.0 1.1 1.2 1.3 1.4 1.5 1.6 Encyclopædia Britannica Online. 2008. Aral Sea. Retrieved May 22, 2008. ↑ WWF. The wonder of wetlands Retrieved May 22, 2008. ↑ Tom Bissell. 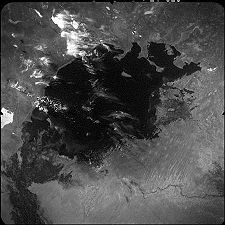 "Eternal Winter: Lessons of the Aral Sea Disaster." Harper's (April 2002): 41–56. ↑ 4.0 4.1 Ilan Greenberg. April 7, 2006. A vanished sea reclaims its form in Central Asia International Herald Tribune. Retrieved May 23, 2008. ↑ The World Bank Group. June 2006. Miraculous Catch in Kazakhstan's Northern Aral Sea Retrieved May 23, 2008. ↑ NASA Earth Observatory. 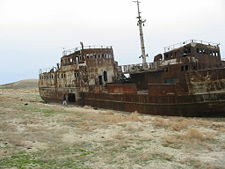 North Aral Sea Recovery. Retrieved May 23, 2008. ↑ The World Bank Group. September 1, 2005. Saving a Corner of the Aral Sea. Retrieved May 23, 2008. ↑ Martin Fletcher. June 23, 2007. The return of the sea. Times Online. Retrieved May 23, 2008. ↑ BBC News. July 2006. A Witch's Brew Retrieved May 23, 2008. ↑ Karakalpaks.. Retrieved May 30, 2008. ↑ Khabar Television/BBC Monitoring. November 20, 2002. Kazakhstan: Vozrozhdeniya Anthrax Burial Sites Destroyed Retrieved May 23, 2008. ↑ ITAR-Tass News Agency. 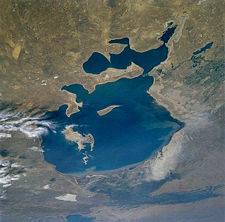 Uzbekistan, international consortium ink deal on exploring Aral Sea. Bendhun F., Renard Ph. 2004. Indirect estimation of groundwater inflows into the Aral sea via a coupled water and salt mass balance model. University of Neuchâtel. Retrieved April 25, 2008. Bissell, Tom. 2002. "ETERNAL WINTER Lessons of the Aral Sea disaster." HARPERS 304 (1823): 41-57. Ellis, William S. 1990. "The Aral: A Soviet Sea Lies Dying." National Geographic 177 (1990), 73–93. Micklin, Philip. 2007. "The Aral Sea Disaster." Annual Review of Earth and Planetary Sciences 35: 47. This page was last modified on 11 April 2016, at 15:30.